"Women don't have heart attacks." It seems like this is what several different doctors thought when they treated a 37 year old woman with shortness of breath and an abnormal EKG. The patient in question was the forensic psychologist Dr. Helen Smith. Her must-read story is published on her blog: More Than You Wanted to Know About My Heart Attack. She indeed had a heart attack and developed complications like a ventricular aneurysm and VF/VT which required treatment with an ICD (implantable cardioverter defibrillator) and Tikosyn. 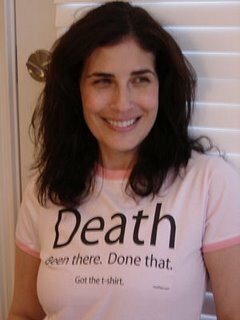 The T-shirt sign "Death. Been There. Done That" is no joke. Dr. Hele (a.k.a.InstaWife) is the spouse of the popular political blogger and a law professor InstaPundit. She has been blogging for only 2 months but her website already gets 1800 visitors daily. It is important to spread the awareness that the number one cause of death in women is cardiovascular disease (not breast cancer). In fact, according to the American Heart Association, cardiovascular disease claims more women's lives than the next six causes of death combined. It looks like Dr. Helen has made a good recovery. We wish her all the best of health for the future. She also wrote about the downsides of the one-payer socialist-type health system in Canada. latest issue is a Heart Health Podcast: cardiac experts answer listeners' questions. It's important to note that while many of the signs of a heart attack are similar for women and men, some are not. For example, women more often report back pain and an impending sense of doom as symptoms. Control your risk factors, learn and watch for symptoms, and seek medical help sooner rather than later, it could save your life. Whoa. This gives major hope to geeks (like me) everywhere. You know how you turn to the sports pages in the newspaper to get the scores? They have a section called "Basketball" and then a section called "Girls Basketball." It's the same way with heart attacks -- there's "heart attack symptoms" and there's "women's heart attack symptoms." And quite frequently, a woman having a heart attack is not having "heart attack symptoms." Just like the girls aren't playing "Basketball." That is heartbreaking--but there are still people who do not believe these problems happen to premenopausal women--it is so important that doctors and patients realize that heart problems are not that rare in women and to take them more seriously in advance. This is the exact reason why we feature Dr. Helen's story - to increase the awareness that women with CAD may present with nonspecific symptoms and their complaints should not be ignored just because they "do not fit" the textbook description of a heart attack. I am another 37 yo woman, normal weight, bp and cholesterol, had a few minor palpitations, and lack of energy after second child, doctors offered tranquilizers for stress. My husband had similar feelings last year, same doctors, and was given the works as far as testing goes, he is younger and fitter than me. I had a heart attack/surgery at the hospital last week after going in with chest pains. I think I would have been sent home as the EGC was normal after pains went away, except my blood tests revealed some cardiac activity. Never self-talk out of these symptoms, time is so critical. an eye opening post for those who think that heart problems mostly occur in men in comparison to women .But if we see facts and figures ,it is found that women do have heart problems as men.Ladies kindly pay attention to your health.dont ignore if you have any heart problem related symptoms.Get a routine check ups....or a better way to get enrolled to a good healthcare.